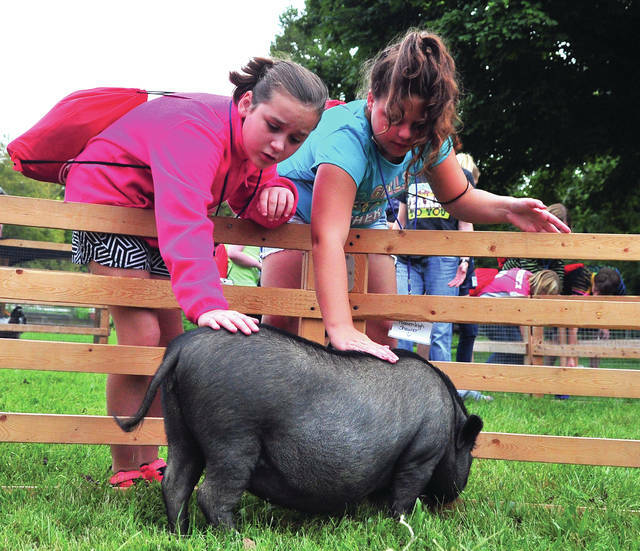 Mike Ullery | Daily Call Piqua Central Intermediate fifth graders Madison Haworth and Heavenleigh Shaurer make friends with a pot-bellied pig during Farm Day at the Miami County Park District’s Lost Creek Reserve on Friday. The event was sponsored by PCIS business partner Hartzell Propeller. 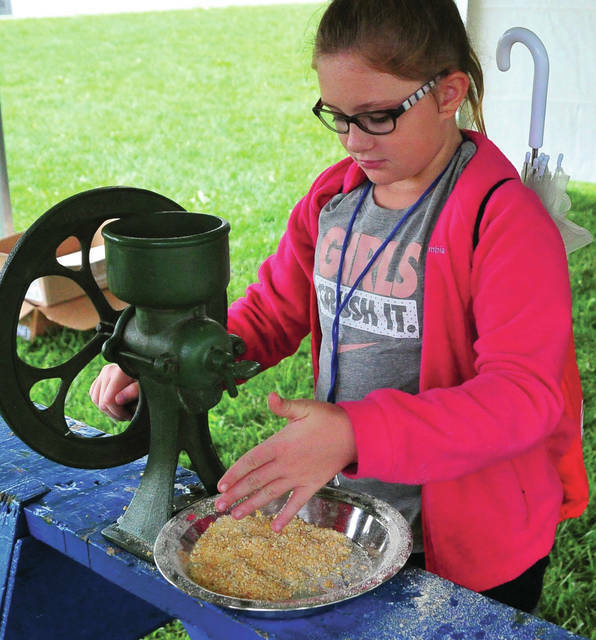 Mike Ullery | Daily Call Briley Miller, a fifth grade student at Piqua Central Intermediate School, tries her hand a grinding corn into meal during Farm Day at Lost Creek Reserve on Friday. PIQUA — Approximately 270 fifth graders from Piqua Central Intermediate School were transported by bus to Lost Creek Reserve on Friday, where they participated in “Hartzell Farm Day,” an annual event hosted by the Miami County Park District. The event, now its 22nd year, was made possible through a partnership between Hartzell Propeller and the Piqua City School district. Breaking off into groups, fifth graders at Farm Day traveled through nine different stations, each featuring hands-on activities or demonstrations. Station activities included corn milling and uses, popcorn making and bobbing for apples, a honey bee presentation, earthball/solar system activities, bouncy ball making, garden harvesting, farm animal activities, native wildlife presentations, and a hayride through the reserve. The first Farm Day took place in 1997, and was hosted on Hess’ own property. “I think it’s a great thing for the district to host,” said Susan Condy, school education coordinator with the Miami County Park District. “It’s an amazing partnership. What Hartzell does for these fifth graders is amazing. They put on this event so kids understand where their food comes from and how farms impact their lives. https://www.dailycall.com/wp-content/uploads/sites/30/2018/09/web1_090618mju_pcis_farmday1-2.jpgMike Ullery | Daily Call Piqua Central Intermediate fifth graders Madison Haworth and Heavenleigh Shaurer make friends with a pot-bellied pig during Farm Day at the Miami County Park District’s Lost Creek Reserve on Friday. The event was sponsored by PCIS business partner Hartzell Propeller. https://www.dailycall.com/wp-content/uploads/sites/30/2018/09/web1_090618mju_pcis_farmday2-2.jpgMike Ullery | Daily Call Briley Miller, a fifth grade student at Piqua Central Intermediate School, tries her hand a grinding corn into meal during Farm Day at Lost Creek Reserve on Friday.